A few of you might have suffered through my obsessive Iskendar kabab ramblings in the past—and this is definitely going to be another one of them. Because Iskendar kabab is that attention-grabber of Turkish kabab dishes that I will never stop loving. 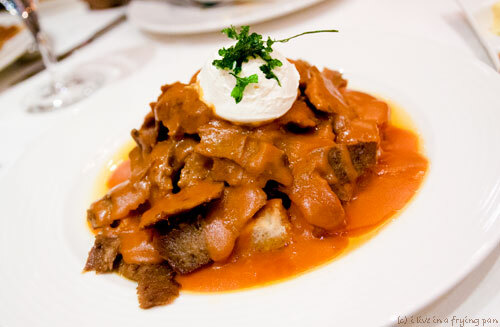 How can you not fall in love with shawarma-thin, crisp-juicy slivers of lamb and beef sprawled out on toasty cushions of pide bread, dripping wet with tomato sauce and cool yogurt, exhaling the soft seductive breath of melted butter all over your face as you lean in for a bite? I thought I’d tasted many a version of Iskendar Kabab in the city. 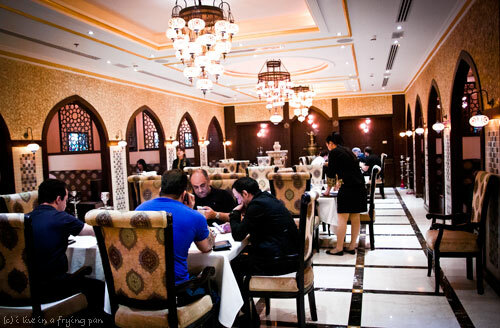 Despite the many versions I've tasted across Dubai (Harput, Bosphorus, Kosebasi, Ankara, the now defunct Shikidim, and my fav, Istanbul Flower), I have never tasted one like the one I’ve had at Yildiz Saray, the new Turkish restaurant in Deira. It was like a gourmet French version of the very rustic, elemental dish that I’ve greedily inhaled at other places. This good-looking hunk of a kabab plate just...blew me away. The kabab slices were soft, chewy, drenched in this incredibly creamy tomato gravy that coats and massages your tongue in ways I haven't previously experienced with Iskendar Kabab. Thick strained yogurt was sculpted on top in an ivory-white dollop, a subtly sour restraining order on all the other rich elements of the dish. Of course there was melted butter, the key element of any Iskendar Kabab creation. Butter on the pide bread chunks lining the bottom of the plate, butter seeping through the cracks between the kabab slices, butter in the air, butter here, butter there, butter blissfully EVERYWHERE. I’m still mulling over how the chef got his tomatoes to assume that luscious, pasta sauce-like texture that was drizzled all over the dish, that too without any cream (to my credit, I did pester the chef for what went into that dreamy sauce after the meal). I doubt the tomatoes in my apartment could ever be elevated to that magical league. If and when I can manage to look past the Iskendar Kabab, everything else at Yildiz Saray was spot on. 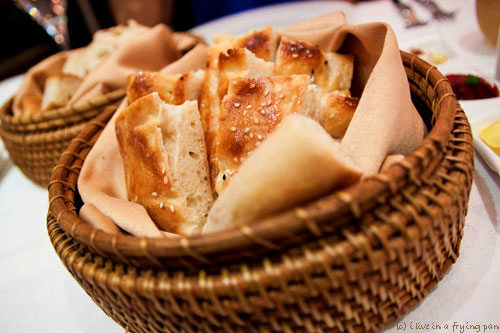 The bread was fresh bouncy pide dotted with sesame seeds, but beware—eat in moderation or kill your appetite for the kababs to follow. 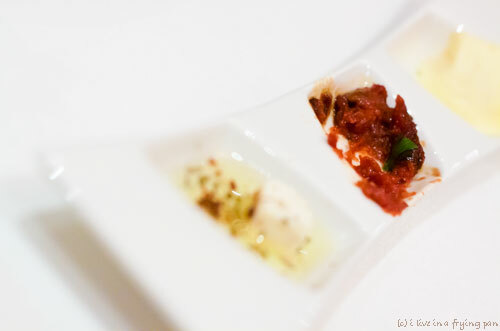 What made it even harder to keep my fingers away from the darned bread basket was this bright tomato-red pepper paste, Ezme, which was tasty not just because it was complementary but because it was born tasty to begin with. Like everything else at Yildiz Saray, it had been thoughtfully composed and balanced—the sweetness of the red peppers, a surprising olive-ish undertone, and a tartness from the shallow maroon rivulet of pomegranate sauce that had been trickled over it. I mean, hear me will you—I can’t even use my usual klutzy words and moronic expressions to describe the meal. Just thinking of the dinner wipes all the resident clowns out of my mind and replaces them with…pretty fluttering butterflies and singing nightingales. And unicorns, there are definitely unicorns. Two baby eggplants emerged as our Imam Bayildi. Each one was a little Noah's arc anchored in a shallow lake of cherry tomatoes and tomato pulp, with sweet fried eggplant flesh, caramelized onions and an unexpected patch of cheese on board. The lahmacun might have been the least of my favourites. The Turkish Pizza had an applaudable char under its crispy base, but the crunch was louder than the quietly thin layer of minced meat sprinkled scantily on top. Give us more meat chef, that’s almost always the answer: MORE MEAT. 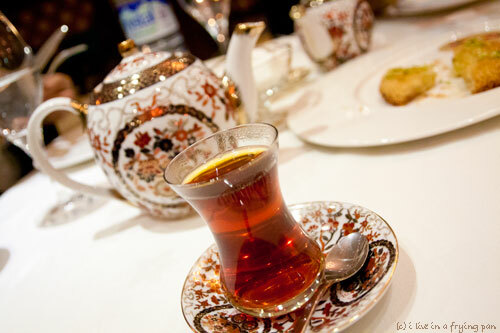 We ended the meal with dessert and cups of Turkish tea. They serve you one pot of concentrated tea, and one pot of hot water, and you make your own optimally strong cup of tea by combining the two at the table. I'm totally using that strategy if a barrage of fussy Indian aunties every visits me for tea in the future. Maktoum Street (same line as Al Khaleej Palace), Deira Dubai. Link to my super-approximate Google Map. Sadly this restaurant is now closed. Dubai, do we really care about seafood sustainability? Apparently not enough to have kept this place alive. Real pity. What is the pricing like ! @twitter-341731963:disqus – It’s pricier than most of the restaurants I review. I could imagine it being AED 80 to 100 per head, though obviously that depends on what and how many dishes you order. However, as there is always a However, the Eskandar Kabab does not look very authentic and seems to have grown up in a touristic fashion. The main variant of Eskandar Kebab is the Yogurt which gives it the velvety and tangy taste. Using strained yogurt or Labneh so to speak in the shape of an Ice Cream scoop does wonders to presentation but moves farther away from the original taste. I am sure the dish taste very nice but it is not the expectation of an Eskandar Kebab. 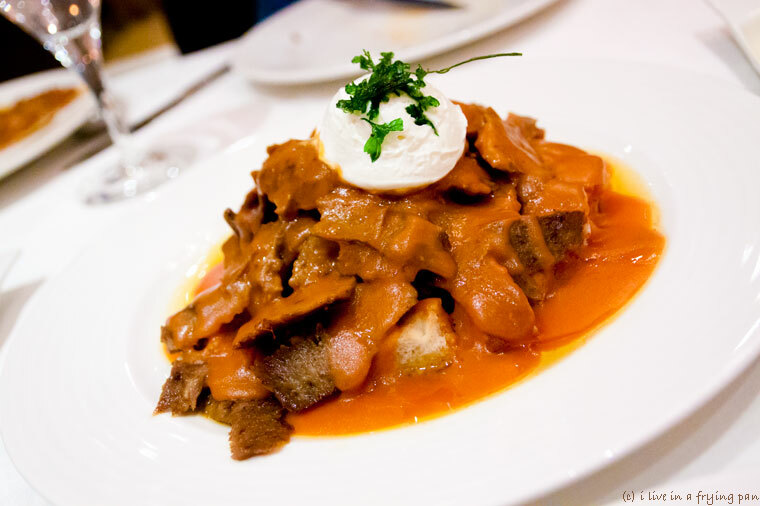 The Batindjan Imam Bayildi in the authentic version should be nestled in a thick sauce of onions, tomatoe and EVOO. I cannot see this is the case. 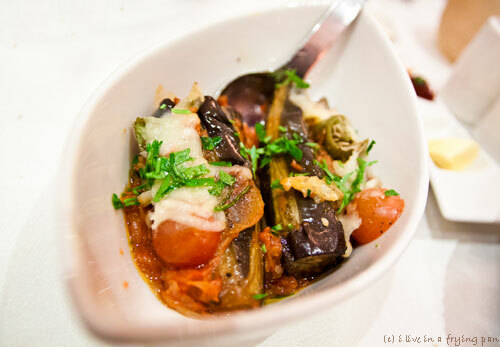 The Litmus test of a Batindjan Imam Bayildi is the single garlic clove resting in the slit Aubergine. I appreciate that most of the recipes printed or digital show unfortunately a variant of the original dish! 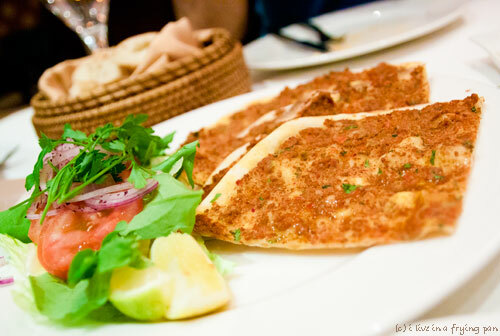 For me, this is not Authentic Turkish food but a Modern variant of Turkish food. This does not negate the restaurant offering and value but merely positions the restaurant in a more defined category. For the dessert, such does not exist. 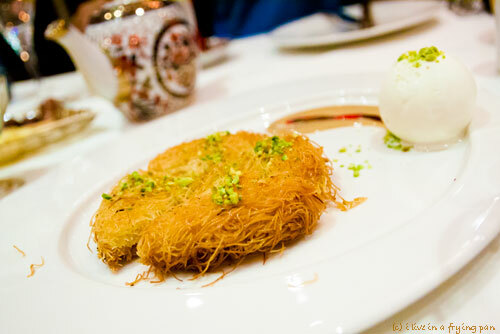 If it is Kunafa, it has to be either cheese or nuts or cream filled. As for having Tahinah with the dish. We do have Tahineh as part of a sweet dessert. One of our Levant sweet delicacies is called: Debs weh Theeneh. Which means Molasses and Tahineh mixed together and eaten with Arabic bread. The Debs Molasses has to be the Levant version which is Carob Molasses. This is different from the Egyptian Molasses which is a Dates Molasses similar to the Gulf area Molasses or Grapes Molasses as I suspect they are using in this Turkish restaurant with the Kunafa or maybe some other sweet jam of some fruit? JayEim – thanks for taking the time out to leave such a thoughtful and detailed response! Yes, completely agree that this is not authentic Turkish, but as I have put it – a more modern, ’Frenchified’ version of the dishes. But excellent nevertheless. Just to clarify, the kunafa was filled with cheese, just not a glaringly thick layer of it. Debs weh Tahina – I have tried dates with tahina, still got to try Debs with Tahina. As for what the restaurant used, my palate wasn’t as discerning as it should have been to figure it out – so my guess is as good as yours! Went here after reading your review and the sauce on the Iskander Kebab was just as you described – rich, velvety and leaving your tongue asking for more! And the Ezme with the bread too, absolutely delicious. We were too full to have desert and it came to more than our usual Hor Al Anz haunts, but deffo worth a visit for something special. Thanks again ILIAFP!!! PS I know I appear to be stalking your recent restaurant visits but I promise my intentions are purely food-related lol. The best bohra (or is it bohri) food experiences that i have had are both home deliveries..its a multi course affair punctuated with ice cream !